Mr Vail Karuppiah is a full-time Consultant Foot and Ankle Specialist at Circle Nottingham. He graduated from JIPMER, Pondicherry, India and started his surgical career in Aberdeen, Scotland, completing his Membership exams. Subsequently, he was appointed as a clinical tutor at the University of Aberdeen and did research towards a higher degree. He was appointed into the Specialist National Orthopaedic Training Programme in the East Midlands, where he worked at various hospitals, including the Queen Medical Centre, Nottingham, Derby Hospitals and Kingsmill Hospital, Mansfield. Mr Karuppiah was trained by prominent Foot and Ankle Surgeons in the region and gained glorifying experiences both in trauma and elective surgery. After completing his fellowship exam, he completed a fellowship programme in Manchester, improving his expertise in foot and ankle reconstruction after trauma. He was selected for an accredited International Specialist training in Foot and Ankle and Knee Fellowship from Australia. Mr Karuppiah sees and treats both NHS and private patients at Circle Nottingham. Mr Karuppiah was trained in orthopaedic surgery at the Queen’s Medical Centre, Nottingham. He has also trained in Australia with prominent surgeons including some travel fellowship. Mr Karuppiah performs a full spectrum of foot and ankle surgery including ankle ligament reconstruction, keyhole surgery, ankle replacement, ankle arthroscopy and MTPJt replacement. He has a special interest in ‘key hole’ foot and ankle surgery and complex reconstruction surgery. Above all, Mr Karuppiah believes in individualised surgery to the patients and professional care for his patients. Mr Karuppiah uses the latest and innovative surgical techniques for the management of various foot and ankle conditions, including treatment of bunion (hallux valgus), lesser toe correction, toe and ankle fusions. He believes in the advantage of using keyhole surgery for the management for foot and ankle conditions, which allows patients for early recovery and less complications. For sports ankle injuries, he uses ligament reconstruction and pioneering techniques such as cartilage transplantation. Surgery is only part of what is required for patients to regain quality of life. Circle Nottingham's physiotherapy specialists can provide advice on preparing for surgery and returning to a normal life afterwards. Mr Karuppiah is married with two children and loves his weekend with his family. He is a keen swimmer and enjoys badminton as a social sport. His wife works as a consultant radiologist. As a family they have a huge passion to travel. 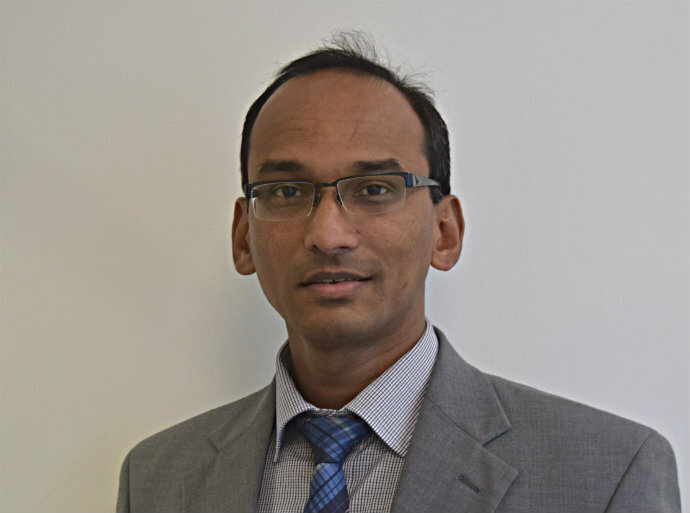 Mr Karuppiah is an active researcher in the field of biomechanics and orthopaedic outcomes. He has passion for teaching and has been part of both undergraduate and postgraduate teaching courses. He has dedicated two years towards extensive research work and won international prizes. Mr Karuppiah has regularly published in international and national publications and presented in various countries. He plays a supervisory role for both medical and engineering students projects towards their higher degree. He is also a faculty member for Royal College of Surgeons Teaching courses. Mr Karuppiah regularly asseses his clinical outcome with patient reported outcome. Mr Karuppiah has extensively published in various International journals and presented both at National and International meetings. Reliability of Ultrasound in the diagnosis of Morton’s neuroma. AOA Regional Scientific Meeting, Feb 2018, Adelaide, Australia. A comparison of Local flaps vs Free flaps for open lower limb fractures: effect of flap choice on healing time, complications and patient reported outcome. AOA Regional Scientific Meeting, Feb 2018, Adelaide, Australia. Tibiotalocalcaneal nail as a treatment option for elderly patients with of ankle fractures. Australian Foot and Ankle Society (AOFAS), Aug 2017, Noosa, Australia. Functional outcomes following percutaneous Achilles tendon repair using the Tenolig implant. Australian Foot and Ankle Society (AOFAS), Aug 2017, Noosa, Australia. Zadek procedure as a treatment option in Haglund’s deformity. Australian Foot and Ankle Society (AOFAS), Aug 2017, Noosa, Australia. Comparision of both arthroscopic and open techniques for arthrodesis ankle. AOA Annual Scientific Meeting, Nov 2017, Adelaide, Australia.